Zoom Player is the most Powerful, Flexible and Customizable Media Player for the Windows PC platform. Using our powerful Smart Play technology, more Video, Audio and Image media formats play with less hassle, increased stability and better performance. Behind Zoom Player's classic media player look, hides a powerful Media Center application designed with a simple 5-Key (up/down/left/right/select) fullscreen navigation interface. The 5-Key system provides simple navigation with advanced interfaces. Interface such as the Media Library, File Browser, Playlist, Color Control, Audio Equalizer, Bookmarks, Play History and many more. Zoom Player's media center simplicity makes it ideal for users with no previous computer experience. 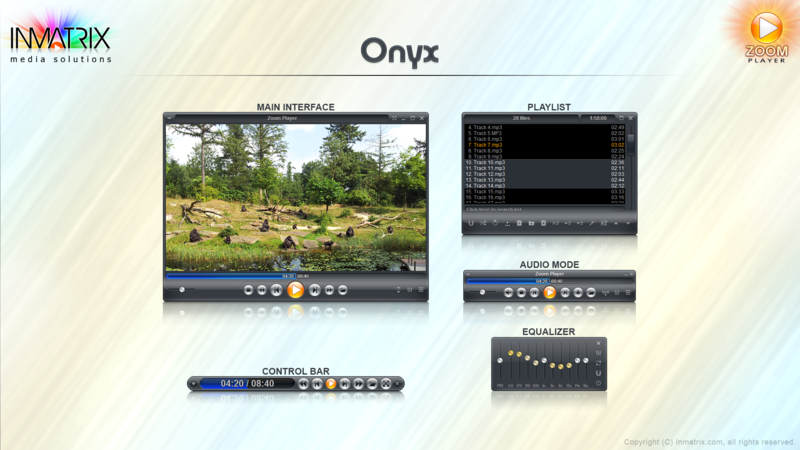 Zoom Player is available in three different versions for home users, Professional, MAX and the free version. For a full comparison of the differences between these version, please refer to this page. Some sites (e.g. facebook) may require you to enable the extended analysismode for the 3DYD filter through the Zoom Player Install Center. * Automatic fullscreen navigation skin switching based on the display'saspect ratio.For example, by specifying a 16:10 and selected a Zoom Player navigationskin designed for 16:10 displays.(e.g. https://www.inmatrix.com/zplayer/nav/default1610.shtml)Note:Skin switching is currently only triggered when opening a navigationinterface. * TheMovieDB.org media library scraping plugin has been enhanced and cannow return non-english meta-data (texts and images). * The playlist editor (when using the default Onyx skin or the bundledAlba skin) now draws alternating line highlights making the playlisteasier to track visually. * The playlist editor's right-click menu now features Colorize actionsthat let you easily color-code track(s) text and background colors.The color information is automatically saved and restored when usingZoom Player's default ZPL format playlists. * New "PlayListData/Background2" skin script parameter that specifiesthe alternating playlist editor line highlight color. * New "Thumb rendering threads" setting (Adv. Options / Interface /Fullscreen Navigation / Thumb View) to specify the number of CPU threadsused to render the thumbview display.Previously, this setting was hard-coded to use 2 threads, but now youcan specify any value from "Auto" to "16".Auto mode uses either 2 or 3 threads depending on your PC, butperformance can be improved further with additional threads on systemscontaining many cores or high bandwidth RAM. * New Setting (Adv. Options / Playback) that automatically tries to usethe YouTube IFRAME player if DirectShow playback of a YouTube streamfails. * New Setting (Adv. Options / Playback / Controls):"Next / Previous Track" plays the next/prev media in the same folder ifplaylist contains 1 file.This function behind this setting was previously always enabled.This setting remains enabled by default, but from now you can disablethis behavior from the advanced options dialog. * New Setting (Adv. Options / Playback / Controls) to mute the audio whenenabling Slow Motion or Fast Play. * New Setting (Adv. Options / Fullscreen Navigation / Customization) toforce the navigation list or thumb view to maximum width.Unlike the "full width" setting, this setting will make the navigationlist area take the display device's maximum resolution, which can causesome cosmetic issues (like the thumbnail highlight getting cropped). * New "Support folders as playlist entries" Setting (Adv. Options /Interface / Playlist). This setting was previously hardcoded andis still enabled by default to support advanced playlist functionality.However, supporting folders as playlist entries triggers a spun-down HDDdrive to spin back up when a playlist is loaded. With this new settingdisabled, you can now prevent drives from accidentally spinning up. * The advanced playlist control (accessible through the playlist editoror by pressing "J") now shows the number of items remaining in theplaylist as the search filters the playlist. * New "Refresh" option (Media Library Category Editor / Configure Category)for YouTube channels and RSS Streams that refreshes the channel's Name & Thumbnail. * New "fnToggleOverlayCover" function to toggle the "Video covers entiredisplay area" setting on and off. + Optimized the Media Library's thumbnail drawing code, increasing updatespeed and smoothness. + The Maximum number of scraping threads used by the media library hasincreased from 8 to 16. + The advanced playlist control's filter search was searching theentire playlist on each letter pressed, this caused a sluggishuser experience when dealing with very larger playlists (over30,000 entries).To enhance the user experience, the search action is now onlyperformed 350-400ms after the last key-stroke, ensuring thatthe user interface does not stall while typing. + When a media library scraped movie did not contain a backdrop image,the default background image is now used instead of a black screen. + Zoom Player now does a better job at extracting album art images frommedia files if the JPEG image contains junk in front of the actual image. + The Install Center now includes two configuration profiles for the3DYD YouTube Source filter that enable HD/4K streaming. + Visualization are now supported when the 3DYD YouTube Source filter isset to "audio only" output. + The Command & Control API now notifies when subtitles are enabled/disabled when using the "fnToggleSub" and "fnDisableDVDsub" functions. + Updated the PNG and zLib libraries to newer versions. - TheAudioDB.com scraper plugin is now functional again after the API usedby the site moved to encrypted communication (https), breaking backwardcompatibility. - TheAudioDB.com media library scraper can now better handle artist namescontaining the "-" character, for example "Alt-J - This Is All Yours"will now properly scrape. - Starting Zoom Player with the "Do not check if a file exists when addingto the playlist" setting enabled no longer triggers spun-down HDD drivesto spin-up. - The GuardDog feature tried to restart Zoom Player if Zoom Player'sload time was taking too long (due to HDD drive spin-ups or a networkdrive reconnection), from now the guard dog feature will only startfunctioning once Zoom Player has finished loading. - When viewing the media library's TV/Movie in JukeBox mode, the backdropimages was not scaled and cropped properly on non-16:9 displays(e.g. 1920x1200 monitor) leaving black bars instead of filling withthe backdrop. - Kinetic scrolling in the media library did not work well using a mousecursor, stopping when attempting to scroll multiple times while thekinetic movement was still in mid process. - Fixed a possible TheMovieDB.org scraper freeze (could have causedslow-downs on exit or more rarely, a player freeze) when used incombination with the "Scrape using media derived title (insteadof file name)" category setting. - The Media Library's Jukebox mode would not enable if the only file inthe folder was a playlist. - Fixed a case where a media library scraped movie not containing abackdrop image showed a backdrop from another movie. - When the "Scrape using media derived title (instead of file name)" categorysetting was enabled, under some conditions, the media's thumbnail would notdisplay after closing and reopening the media library. - Playing media that contained certain special characters in the media'stitle caused multiple unplayable entries to appear in the play history. - If a media title contained a 'line feed' or 'return' characters, it wouldcorrupt the play history. - With the "Adv. Options / Interface / Position & Size - Auto-Size UserInterface to maintain Video Aspect Ratio (when resizing)" setting enabled,playing audio files with folder/album art could cause Zoom Player's mainwindow to display partially off-screen. - The latest version of mediainfo DLL changed how it extracts cover artfor audio files, breaking Zoom Player support for displaying the albumart with some audio formats (mainly M4A). - Better album art image extraction from audio files with ID3v2 TAGs whenthe image header included some junk data. - When opening a media file by double-clicking from explorer (or otherfile managers), the currently playing track wouldn't highlight correctlyand show the playing position in the playlist editor. - Using the "Stop" function while a JPEG/PNG image was loading, combinedwith a setting that closes the playing media when using the "Stop"function, caused the image to remain on screen under some conditions. - Double-clicking an entry on the skin selection dialog could sometimestrigger an access violation error. - When opening the playlist editor, under some conditions the bottomentries would not show up until the playlist screen was refreshedby a click or scroll. - The "&" character wasn't showing up in the playlist editor. - Pressing under the last item in the playlist editor did notvisually select the last item in the list. Then if you pressedthe "Enter" key, it would start playing the last item in theplaylist which was a bit confusing without the visual cue ofa selected entry. - Fixed a crash when trying to play a video file with too manyexternal audio tracks. External audio tracks are now limitedto a maximum of 10 tracks. - When the "Force the navigation list or thumb view display to full width"setting was enabled in combination with the "Use dynamically visiblescroll bar" setting, the thumbnail would not highlight correctly. - Zoom Player will no longer try running MediaInfo.dll when playing a URL,removing the 'unknown error' message from the play information dialogs. - Using the "^" character in a file name to force the media libraryscraper to ignore any text after this character did not work properlyin some cases. - The "Mute audio during forward and backward seeks" setting was mutingaudio when attempting to seek forward/backward in a live stream evenin cases where seeking was not possible.